NELLIS AIR FORCE BASE, Nev., — What you eat matters, especially if you want to perform your best. Food and nutrition play an important role in military capability. Appropriate food, in terms of both quality and quantity, and adequate hydration are required to ensure that the physical capability and mental performance of military personnel remain at optimal levels. Nutrition plays such an important role in one’s overall health and wellness, and with March being National Nutrition Month® it is important to understand what is and isn’t healthy. With varying opinions on the internet, television shows and by so-called nutrition “experts” it’s hard to know where to begin to look for trustworthy health information. The 99th Medical Support Squadron is here to answer nutrition questions, provide accurate nutrition information and give the tools needed to help one establish a healthier eating style. “We have a pretty diverse mission,” said Maj. Saunya Bright, 99th MDSS flight commander and Air Combat Command nutrition consultant. “We have an inpatient feeding mission where we provide therapeutic diets to patients who have been admitted to the hospital. We cater the diet to what the patient’s conditions are and their diets can run the gamut. We have about 38 different diets that we provide and they can range from people who have diabetes to renal disease or cardiac issues and more. “Secondly, we have a staff and outpatient feeding mission which is our dining facility located in the Mike O’Callaghan Federal Medical Center. The dining facility is open from breakfast to lunch and we serve about 200 to 300 people a day. Our goal is to provide healthy wholesome meals and promote our Go-for-Green program (G4G). The G4G is a Department of Defense program that promotes healthful food and beverage choices in order to optimize performance, readiness, and the health of our service members. By identifying nutrient-rich foods and beverages and placing of foods in prominent places in the dining facility, G4G prompts service members to make better choices, more often. The program enables dining facilities to create and offer more nutrient-rich food and beverage choices that are easy to identify and appealing. 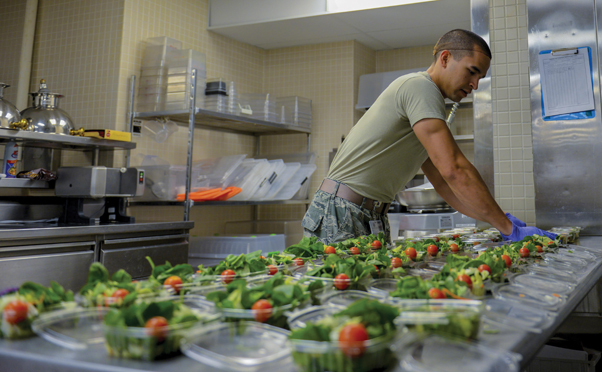 By helping dining facilities serve and promote more nutrient-rich green-coded food choices and educating service members, G4G can impact diner behavior and, in turn, the nutritional fitness of the services. Another program that the 99th MDSS offers is the MyPlate class, which offers tips and information on eating right. The MyPlate is a reminder to find one’s healthy eating style and build it throughout one’s lifetime. Everything you eat and drink matters, and with the right mix can help one be healthier now and in the future. This can be accomplished by focusing on the variety, amount, and nutrition of the food one eats. It is important to choose foods and beverages with less saturated fat, sodium and added sugars. Also, start with small changes to build healthier eating styles and support healthy eating for everyone. Eating healthy is a journey shaped by many factors, including our stages of life, situations, preferences, access to foods, cultures, traditions, and the personal decisions we make over time. All your food and beverage choices count, and MyPlate offers ideas and tips to help one create a healthier eating style that meets one’s individual needs and improves one’s health. There are many resources at our disposal that provides accurate information on nutrition and provide the tools to help get on track with having a healthier eating lifestyle. A site that Maj. Bright highly recommends utilizing is the Human Performance Research Center website (www.hprc-online.org). The HPRC’s human performance optimization (HPO) website is for U.S. Warfighters, their families, and those in the field of HPO who support them. The goal is Total Force Fitness: Warfighters optimized to carry out their mission as safely and effectively as possible. “The HPRC site has a lot of tools,” said Bright. “It even includes an ask the expert link to answer any question one might have and has the natural comprehensive database where you can go and plug in any supplement that you are taking or want to do research on. It lets you know whether or not that supplement is truly something that is safe to take. “The database is accessible to active duty members with a common access card and provides a ranking on a scale from one to ten on how reliable the supplement or product is. It gives the ingredient list, effectiveness and whether or not there are any safety concerns. For those looking to improve their nutrition, Airman Shannon had three easy tips to follow to help achieve the goal of living a healthier lifestyle. Health Promotion Operations offers a variety of free exercise and nutrition classes every week at the HAWC. The programs are available to all active duty, dependents, retirees, and DoD civilian employees. Personnel are also available to come to your squadron to brief topics on nutrition, fitness, stress management and other health topics.